The combined average temperature over global land and ocean surfaces for May 2013 tied with 1998 and 2005 as the third warmest on record, at 0.66C (1.19F) above the 20th century average of 14.8C (58.6F). The global land surface temperature was 1.11C (2.00F) above the 20th century average of 11.1C (52.0F), also the third warmest May on record. For the ocean, the May global sea surface temperature was 0.49C (0.88F) above the 20th century average of 16.3C (61.3F), tying with 2003 and 2009 as the fifth warmest May on record. 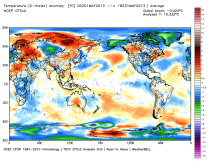 Global composite temp. 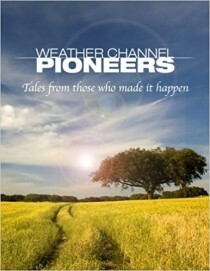 : +0.07 C (about 0.13 degrees Fahrenheit) above 30-year average for May. 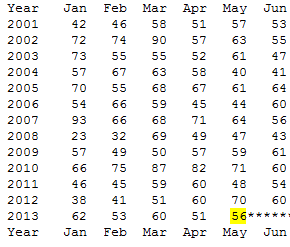 Northern Hemisphere: +0.16 C (about 0.29 degrees Fahrenheit) above 30-year average for May. 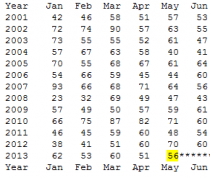 Southern Hemisphere: -0.01 C (about 0.02 degrees Fahrenheit) below 30-year average for May. 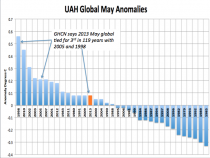 Global average temperatures and the tropics continued a slow cooling drift in May, downward from a warm January, said Dr. John Christy, a professor of atmospheric science and director of the Earth System Science Center (ESSC) at The University of Alabama in Huntsville. Compared to seasonal norms, during May the coldest area on the globe was in northern Greenland, where the average temperature was as much as 3.75 C (about 6.7 degrees Fahrenheit) cooler than seasonal norms. 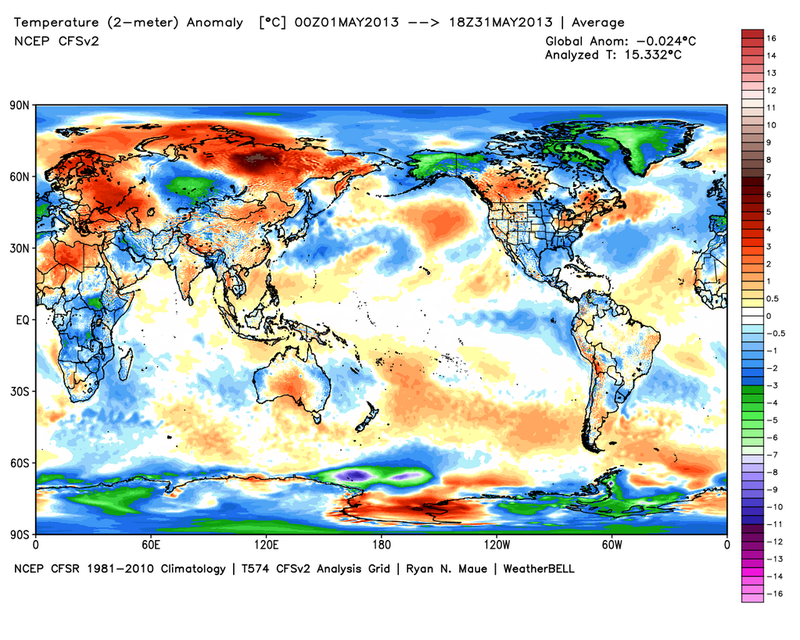 Compared to seasonal norms, the “warmest” area on the globe in May was in the northern Siberia. Temperatures there were as much as 3.91 C (about 7.0 degrees Fahrenheit) warmer than seasonal norms for May. 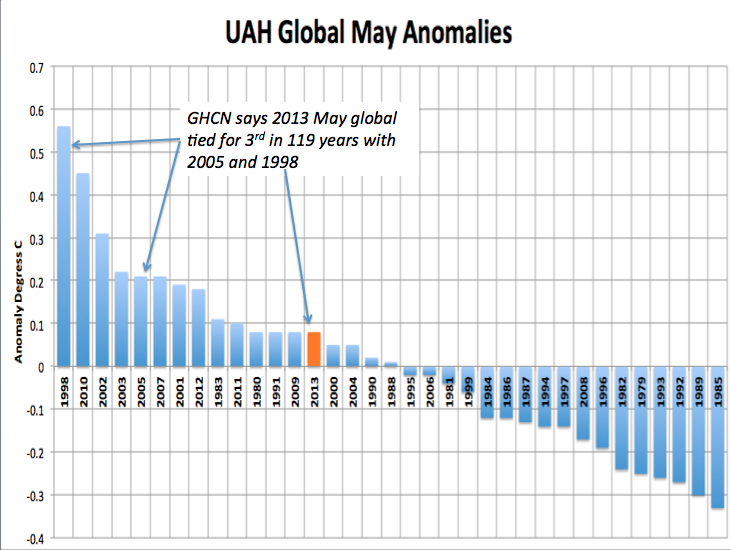 In addition to the discrepancy in terms of ranking, the claim that GHCN was tied for third place with 1998 and 2005 is out of line with UAH which had 2013 very different from 1998. 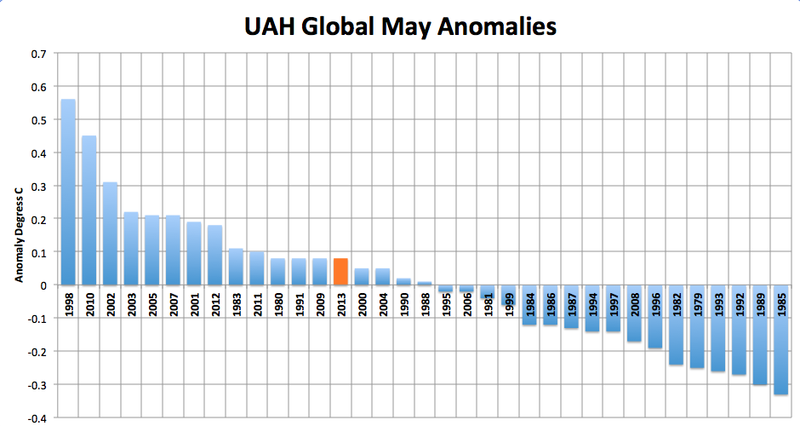 RSS, the other satellite date set is colder than UAH and significantly colder than NOAA. Even GISS from NASA (usually the warmest data set) was cooler by 0.10C than NOAA and actually the 5th coldest in the last 13 years!!! The government announced major plans for climate and energy policy will be forthcoming this summer. Looks like NOAA is trying to accommodate this. The data like most government data is said to be preliminary. We will continue to follow.